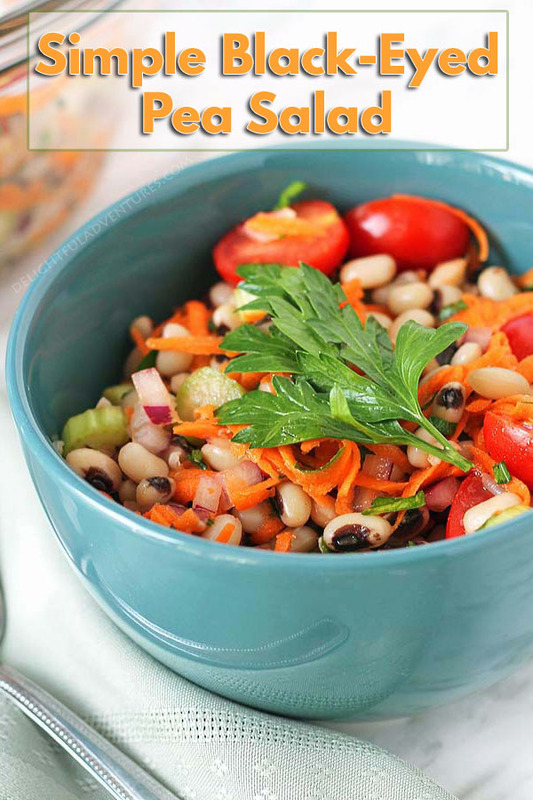 Perfect for lunch, a side dish, or even a light supper, you’re going to love this Simple Black-Eyed Pea Salad because it’s delicious and so easy to make. So apparently, eating black-eyed peas on new year’s day for good luck is a thing. How did I not know that until this past December? I only learned about this tradition on new year’s eve, so I didn’t have any black-eyed pea dishes planned. But I wanted to make one, because why not? It may all be for fun, but who wouldn’t want the chance at a bit of good luck in the new year? I checked to see what I had in the cupboards and fridge. Luckily, I had some dried black-eyed peas and lots of veggies. So with what I had, I threw together this simple black-eyed pea salad as a side dish for our new year’s day supper. When I say this salad is simple, I mean it’s really simple. You probably have most, if not all, of the veggies in your fridge right now. And if you don’t have something, you can swap things out. It’s also a very flexible recipe. 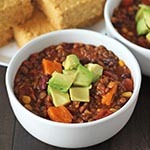 You can add different things to it, depending on your tastes (red bell pepper, green bell pepper, corn, etc.). 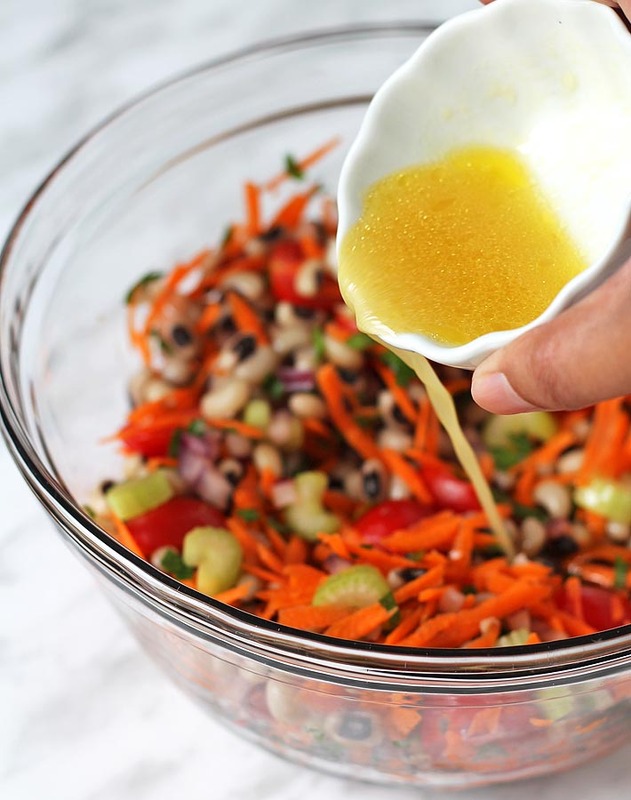 The dressing is also simple, just four ingredients and it’s super tangy with a very slight hint of sweet. See? Quick and easy, right? My kind of recipe. Another plus for this recipe, other than being really easy to make (and the chance of it bringing you a little luck! ), is that it can be used in many ways. 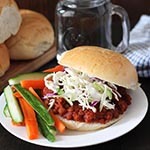 You can serve it as a side dish, a light dinner, a potluck contribution, a summer BBQ salad, and even lunch. Since making this salad on new year’s day, it has become a go-to for lunches. Despite having easy access to all of the recipes on the internet, the many cookbooks I own, and even all of my own recipes, I always seem to have a problem with lunch. I work from home, and I can sometimes get really into my work, so when it’s lunch time, I want to have something quick, nutritious, and delicious. 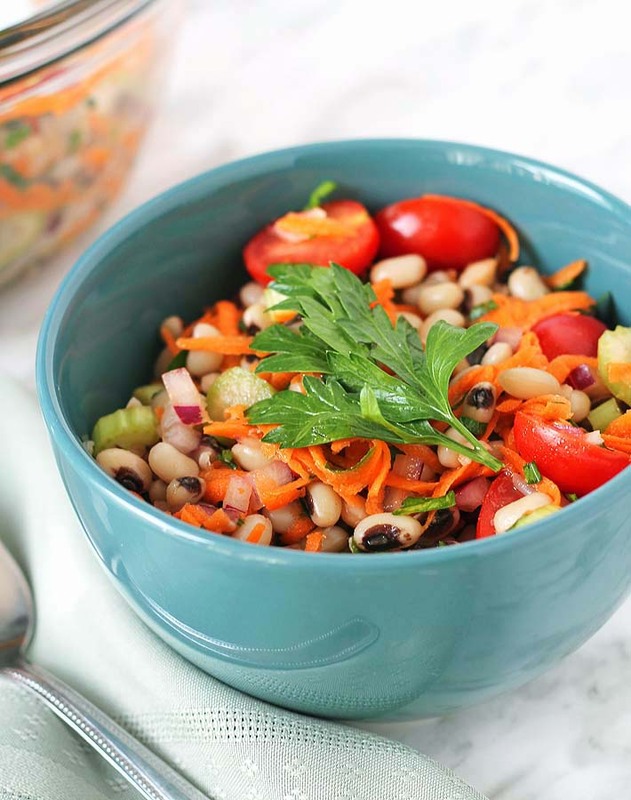 This simple black-eyed pea salad recipe has, thankfully, become one of the solutions to that problem. I like to make it on the weekend and have it ready for lunches during the week. Salads are usually pretty simple to make and it doesn’t get any more simple than this. If you make it, tag me on Instagram (@delightfuladventures) or post a pic of it on my Facebook wall. I’d love to see! 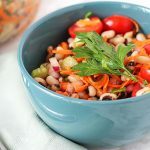 Perfect for lunch, a side dish, or even a light supper, you're going to love this Simple Black-Eyed Pea Salad because it's delicious and so easy to make. 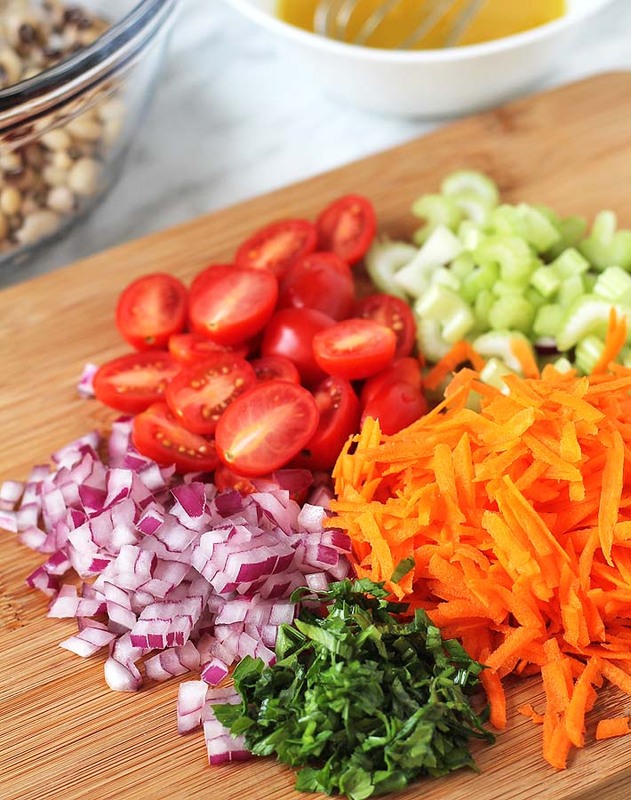 Add all salad ingredients to a bowl. Mix. Add all dressing ingredients to a small bowl and whisk together. Pour dressing over salad and mix until dressing has coated the entire salad. 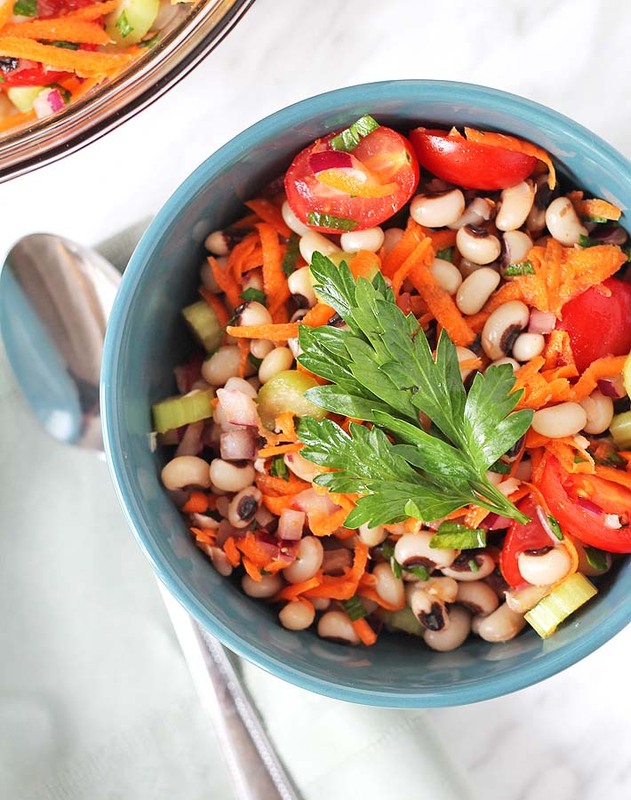 I use dried black-eyed peas to make this salad. I soak them overnight and boil them the day I am making the salad. If you prefer to use canned black-eyed peas, that is fine! Just be sure to rinse them well before using. Nutrition info is for 1 of 4 servings and based on the recipe as it is written and is to be used only as a rough guide. Click here to learn how nutrition info is calculated on this website. So simple and so bright and colourful. I love that. I also appreciate that you cut your grape tomatoes in half. Is there anything worse than a giant grape or cherry tomato exploding – all over your laptop – when you bite it? *shudders* Hee hee! Oh, and I love your videos! So fun! I’m glad you’re enjoying the videos, I’m enjoying making them. Why did I wait so long?! And yes, the tomatoes always need to be cut in half, I’ve had a couple cherry tomato exploding incidents 🙂 If you try the recipe, let me know. It’s perfect for lunch when you work from home. 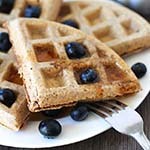 I love your recipe and video! I make a black eyed pea salad at New Year’s, but it’s completely different from yours. I’m happy that now I have two black eyed peas salads I can make! Two choices are always better than one 🙂 Thanks so much, Amy!